i Phones getting popular in the world,but what we find is Android Phones are better than iPhones, its a personal belief upon some statistics shown below. 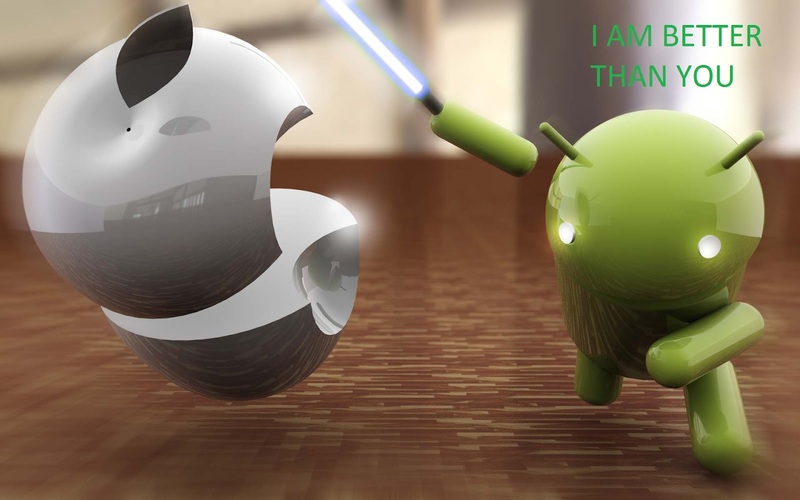 Despite a lot of effort, Android phones will continue to dominate. No, it is not our love for open source that makes us say that... Android really has come edgy technology that makes it beat the iPhone 5 pretty easily. For the first time Apple recognised the importance of larger screens in smartphones and came up with a 10.2-cm (4-inch) display. BUT, Android has always a master when it comes to screen sizes. Android's Droid RAZR M, which sports a 10.9-cm (4.3-inch) display is considered a compact device. iPhone 5's biggest competition Samsung Galaxy SIII comes with a 12.2-cm (4.8-inch) display while the Galaxy Note II comes with a whopping 14-cm (5.5-inch) display. For someone who wants a large screen phone for making the experience of watching videos better and for easier reading of text, Android phones are a better option any day. If you are the owner of iPhone 5, forget about leveraging the mobile payment systems which allow the user to touch their device with a reader to carry out a transaction. Apple plans to bring NFC support on the iPhone 6 in 2013. Whereas, Android scores in this department as well . The latest Android devices are NFC-enabled. The can not only carry out monetary transactions but can also share videos, photos, contacts and much more just by tapping the backs of two devices together. Android brought NFC sharing software, Android Beam, with its last version Android 4.0 aka Ice Cream Sandwich. iPhone users have finally got an extra row of icons with iPhone 5, which were absent in iPhone 4 and 4S. Users can now see their TweetDeck icon on the home screen and tap it without scrolling over. But this is something where Apple has taken to arrive. Its a usual thing for an Android user. An Android users gets more than just a fixed set of application icons on his home screen. Android users are given a working desktop where they can fill with interactive widgets. For Android, micro USB is a standard. Infact, European Union has instructed the phone manufacturers to incorporate micro USB for charging as it reduces waste because the users may have their old cables. But, iPhone 5 doesn't have the provision for micro USB and the users have to resort to a proprietary connector, called 'Lightning'. Apple has included it probably because it can make money by selling proprietary wires and make iPhone 4S owners upgrade their accessories if they are buying the new iPhone. iPhone 5 users can use any stock iOS 6 keyboard. But, Android users have an advantage. If they do not like Google's default layout, they are free to go for a a third-party keyboard. Some of the finest third-party keyboards that Android offers include Swype, which enables the users to create words by tracing between letters on the keyboard, and SwiftKey, which predicts the next word in your sentence to save you keystrokes. Heck, you can even buy an Android slider like the Motorola Droid 4, which has a real physical keyboard. Apple is a bit protective about using immature technologies. Probably that's the reason why the company has not incorporated 'email attachments' feature on iPhone 5. However, the new iOS 6 mail is better than the previous versions. The previous versions did not offer any attachment options in its message composer in the iOS mail, the new iOS 6 mail, that comes with iPhone 5, gives the users the option of attaching images or video only. Whereas, Android offers an entirely different experience. If you have to send a document to your boss urgently while you are out of office, just use an app that opens that kind of file. Go to that app and you can easily send the file from there. Android allows the users to attach the files they want to send with any email message. So these are the facts that makes Android better than iPhone 5. But its totally dependent on your need that what kind of features you require. iPhone is also best at its place but Android phones play a vital role in giving all the features required by a general man, its cost savvy and so its better. i guess we'll hav to wait and see to what response we get from the market in the upcoming years!! @ Raj Singhania buddy you are slightly away from the topic its clearly mentioned in the para that present phones of android have most of the best features which i phone lacks. This topic deals mainly with what iPhone 5 don't have but the Android phones in the market already have. We live in a house divided with one of us preferring Android, another dedicated to iPhone and a third waiting for the latest Windows release. At least we can all communicate, no matter where we are or which device we choose.